Southeast Asia was born from a long history of regions that stretched from north to south, namely the region referred to as Indo-China, the area on the Malay Peninsula, the area in the Indian Ocean Islands, and in the Philippine Islands. Geographically, the Southeast Asia region is a strategic region in terms of politics, economy, social and culture. The area is united in cultural differences with various regional conditions resulting in different character of the community. Understanding of the character of each country is needed in building a harmonious community as aspired in the 2015 ASEAN Community. Southeast Asia is expected to be a region that is peaceful, democratic, open, fair, transparent, tolerant, inclusive, harmonious with markets and a single production base people oriented with the slogan "one vision, one identity, one community". An understanding of the mother tongue of each country is relevant and important to do with fields that are both practical and academic. 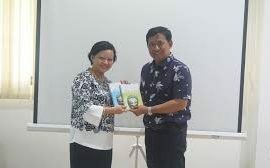 For this reason, the Center for Southeast Asian Social Studies at the University of Gadjah Mada conducted training in Southeast Asian languages ​​summarized in the Southeast Asian Languages ​​Program (SEA-GATE) program. Currently available are Indonesian, Thai and Vietnamese. The program aims to provide an understanding of Southeast Asian society and culture through language. Besides through language, participants will also explore directly culture and society by conducting research (especially for Indonesian language programs). The program is divided into three levels, namely elementary, secondary and advanced levels with a total of 50 hours at each level. The time needed to learn languages ​​is between one and three months. Participants will be facilitated to achieve language learning goals through fun activities inside and outside the classroom. In class, participants will learn to master the main aspects of language skills, namely writing, reading, listening and speaking. While a basic tutorial will be provided to enrich the participants' knowledge about the everyday expressions of language and the cultural life of the language user community.